Wingerworth Hall History in a nutshell. There is little evidence of Prehistoric/Roman/Anglo-Saxon occupation in the Wingerworth area. There are less than 200 Sites and Monuments Records in the County SMR for the period AD401-10661 and most of these relate to burials in the Peak District, churches and crosses. By the time of the Domesday Book Wingerworth is documented as Wingreurde at which time it was owned by the crown. Thus Wingerworth was part of of the King’s manor of Newbold in 1086 and remained so until about 1160 when Henry II granted it to Nicholas de Brailsford, son of Elfin, Saxon landowner there. The Brailsfords held Wingerworth until c.1380 when the senior male line failed, afterwards a cadet branch (younger sons) remained as prosperous yeomen on estates called The Hill and Little Brailsford in neighbouring North Wingfield and in Wingerworth. A heiress of Sir Henry de Brailsford, married Sir John Basset of Cheadle, Staffordshire (his second marriage) in c.1375 and the inherited Brailsford estate from her father Sir Henry passed to the Basset family. 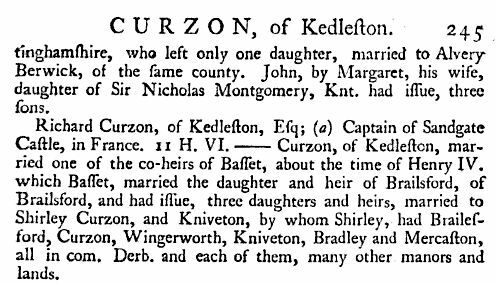 One daughter brought the estate of Wingerworth to her husband Ralph Curzon of Kedleston eldest son of John Curzon and Margaret. 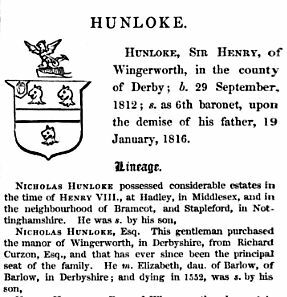 Whatever the case, the Hunlokes became the dominant family in Wingerworth, when the manor was purchased, being involved for 400 years and over eleven generations. Until the mid-19th century the property descended through the male line and then through the female line for the last two generations. 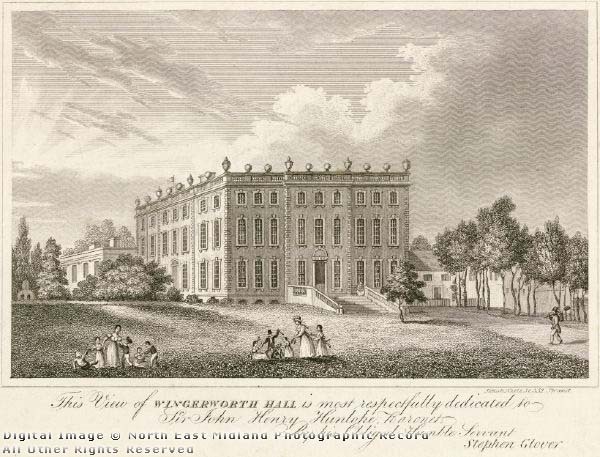 The first Wingerworth Hall was a small hall, of which little is known, when built it enforced their status. “The table commemorates the marriage of Sir Henry Hunloke [Henry IV] (1645-1714) to Katherine Tyrwitt (1657-1737) on 28th January 1673/4. The table may have been designed to contain the marriage settlement which was dated 27th January 1673. Katherine was the sole heiress of the Tyrwhitt family whose seat was Ketleby in Lincolnshire. The savage man represents the Tyrwitt family crest (a savage man proper cincinctured and wreathed vert holding in both hands a club). 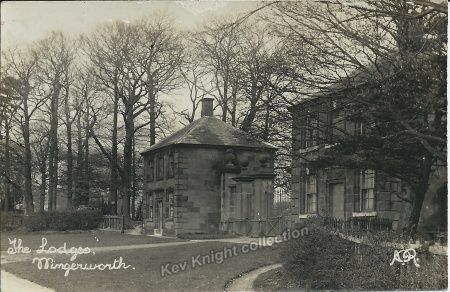 Wingerworth was the seat of the Hunloke family who were recusants. The cockatrice represents their crest (on a chapeau azure turned up ermine a cockatrice with wings expanded proper combed beak and wattled or). The representation of the house with its turrets, symmetrical elevation and surmounting battlements reflects the influence of the Smythsons. Wingerworth was only a few miles from another Smythson house, Hardwick Hall. (Mark Girouard, Robert Smythson & The Elizabethan Country House, 1983, pp.276-7, fig.194, footnote 36. ) The Hall was rebuilt in the late 1720s and demolished in the 1920s. The Will of Henry Hunloke written in 1711 specifies that his wife Catherine was to receive all his jewels and ‘all the furniture in the chamber where now she lies..the dressing plate standing upon her toilet. The table is shown in the centre of the Oak Drawing Room at Wingerworth in Country Life, 1910. 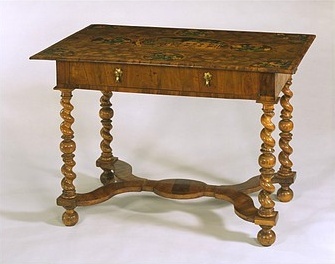 The table has been dated to having been made in 1674. Although it is more than likely that the table depicts the old Wingerworth Hall (as stated by the label underneath) the accuracy of this is unknown and is probably stylised. This castellated house was said to have been built of ashlar, probably from coal measure sandstone, most likely deep hard rock from Birdholme. It had a front of five bays with both ends having full height canted bays (a canted bay Window has a straight front and angled sides). The general style is said to strongly resemble that of Barlborough Hall but this is highly subjective and may just be a case of one stone mason adapting another’s ideas. There is some conjecture over the architect of the original Wingerworth Hall although some agreement is that it was in the Smythson style and could well have been built c.1596/1605 (whilst Robert Smythson was alive). Smythson also designed nearby Hardwick Hall and Barlborough Hall. In ‘Smith of Warwick. Francis Smith, Architect and Master-Builder’ Andor Gomme argued convincingly that the honour lies with Francis Smith of Warwick who had also been working on Sutton Scarsdale hall, a few miles away. An inventory was taken in 1663 mentioning great parlour, buttery, cellar, kitchen, dairy and brew-house, new cellar, dairy chamber lady chamber and maids’ chamber. This was taken one year after the hearth tax return assessed the house on a modest eight hearths which made it a little larger then Repton Park, a sporting seat only2. His son Henry II (1577-1624) was made Sheriff of Derbyshire for 1623-4, which shows that the Hunlokes were then at the level of “county gentry”, a step above the minor gentry 18 “having previously held the office of captain of the trained band for the hundreds of Scarsdale and High Peak, a position of which he was relieved at his own request during his year as sheriff”. On 15 August 1624 Henry II met King James I in his official capacity as sheriff and is said to have collapsed and died in the King’s presence at Ilkeston, aged 47. Henry III (1618-1648) was six years old when his father died. He was educated in the legal profession at Grays Inn and had barely reached adulthood when the civil war broke out. As the family were staunch Royalists he fought for the King at the Battle of Edgehill and for his services was knighted and later became a Baronet which in status is between a knighthood and a peerage. In 1643 Wingerworth Hall was garrisoned by 100 Parliamentary troops whilst Henry III was away fighting for the King. After its surrender it was commandeered by Sir John Gell, but his commander there, Capt Tyler, was flushed out by the Marquess of Newcastle sometime later that year2. On Henry Hunloke’s return in 1645 he, along with other royalists, was forced to pay or ‘compound’ for the continued ownership of the estate. This was a process where Royalists who had fought against the English Parliament had their estates confiscated and were forced to pay a fine and pledge not to take up arms against Parliament again. The size of the fine they had to pay depended on the worth of the estate and how great their support for the Royalist cause had been. He died two years after his return aged 29. His son Henry IV (1648-1715) came of age in 1666 and took over the estate when his mother and her husband moved to nearby Stubbing Edge Hall, Ashover. 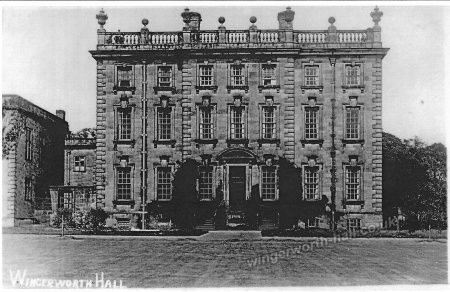 Wingerworth Hall must have been extended shortly after this as in 1670 it was assessed at 14 hearths which made it the largest dwelling in Wingerworth. This coincided with the addition of two parallel ranges being added to the west front which it is suggested still survive2 although the southernmost one ” appears to have acquired a new south front of seven classical bays, the central one having a Gibbs surround.” This was said to have been the chapel which is in line with the recusancy of the family. The other wing contained offices, kitchens etc but a date stone of 1698, remaining in the 1729 house suggests another later rebuilding phase. Sir Thomas Windsor II, 3rd Baronet (1684-1752) received additional income following the deaths of his mother and brother and used this to replace the hall. Work began in 1726 and was completed by 1729. 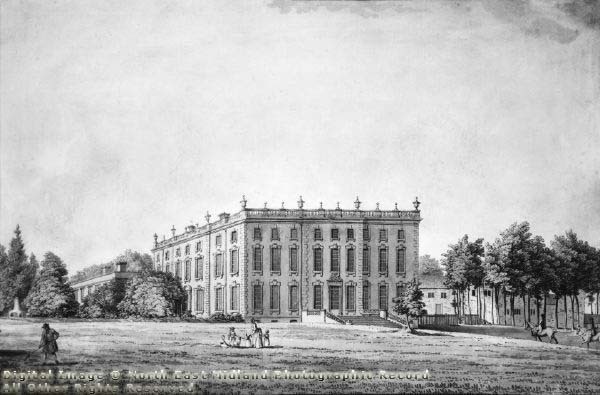 Sir Thomas relocated to his other estate at Stretton in Staffordshire whilst the rebuilding work was carried out and took up residence in the new hall in 1730. One account19 associates William Talman with the hall but as he died in 1719 this is unlikely to be the case. The sale catalogue also attributes Talman with the design and building of Wingerworth Hall so presumably they used the same incorrect source. Without doubt it was Francis Smith of Warwick who was commissioned to build the new house. Professor Andor Gomme and Sir Howard Colvin both agree that it would have been Smith. In 1725 Smith was finishing rebuilding All Saints’ in Derby and also working not so far away on Alfreton Hall and had also worked on Scarsdale Hall. This image is courtesy of Picture the Past, it is dated 1783, was originally from Appleby Bros and credited to D G Edwards. It shows the South and east fronts, with estate office at rear. Photographed from a watercolour pen drawing by Samuel Grimm (1733-1794) from ex Locker Lampson collection, in saleroom of Appleby Bros., Ltd., London, 1968, price £300. 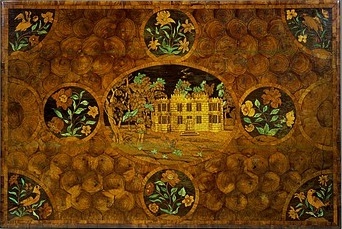 This image is courtesy of Picture the Past, it is dated c1800 and credited to Miss Frances Webb. This image is courtesy of Picture the Past, it is dated c1890 and credited to D G Edwards. 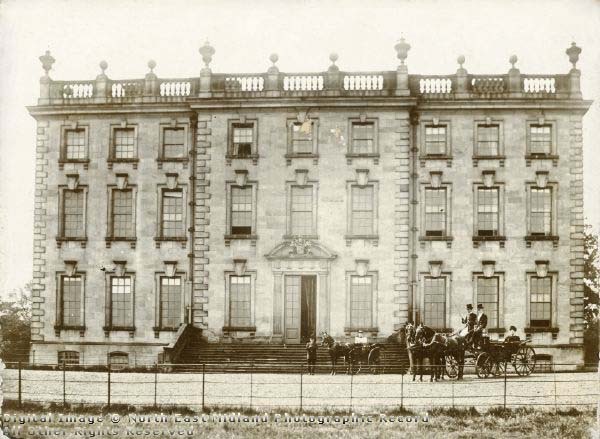 Showing east front of Wingerworth Hall; the lady in the four-wheel carriage is undoubtedly Mrs Adelaide Hunloke. Although the exterior was lacking in vitality, imagination or distinction being rather prosaic or dull the interior made up for this many times over. Worsley24 describes it as ” a model of what one might call the English Rural Baroque“. Views of the interior can be seen on another page. 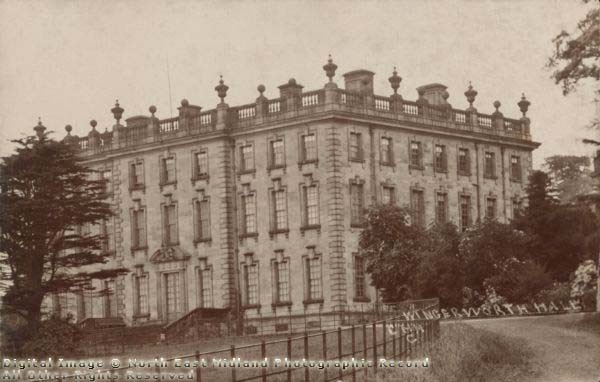 Wingerworth Hall was positioned to take advantage of the extensive views at the time of its construction but this was later to be spoilt by the industry which grew around it. In 1753-54, William Baker of Audlem was working at Wingerworth2 and drew up a plan for the layout of the 107 acre park but there is no evidence that this work was carried out. He may have been responsible for the south front of the chapel but this could have been the work of Smith. Thomas Windsor IV 5th Baronet (1773-1816) inherited in 1804 and continued to develop the estate. The park was also subject to a scheme of improvement by William Emes in 1777 and some work may have been carried out at this time including the modest lake to the west. In 1788 Sir Humphrey Repton, landscape designer, was commissioned and subsequently produced one of his famous ‘Red Books‘ with his suggested improvements. Repton is said to have stayed at Wingerworth at 5 guineas a day. Repton normally acted as a consultant and left it to the owners to arrange for his suggestions to be implemented leaving them free to decide what level of work would be carried out or could be afforded. Sir Thomas had considerable commitments at this time. Consequently only the lodges he suggested at the west gate were built in 1794 and other minor works were completed. The wrought iron gates were hung from six ashlar piers topped with balls as can be seen in this postcard. In 1779 the estate was 2,306 acres, rising to 2,709 in the following century. Although, in 1779 at its peak18 , the total area of the estate (which included land in Tupton, Woodthorpe, Egstow, Hasland, Ashover and Williamthorpe area) exceeded 6,000 acres. Despite its size development of the estate was restricted. Between 1779 and 1819 there was an increase in the number of houses but after this date a steady decline in housing and thereforte reduction in population until the estate was sold in 1920. Consequently the workers needed to support the coal, ironstone and quarrying industries came in daily from surrounding areas. Due to pressing financial problems, Sir Thomas moved with his family to Paris in 1815 where the cost of living was lower and allowing him to generate some income by letting Wingerworth Hall. He died in Paris aged 43 leaving his three year old son Henry Joseph the 6th Baronet (1812-1856) as heir. Trustees were appointed to sell properties whilst Lady Hunloke remained in Paris but this was the start of the decline of the Wingerworth Estate despite it having iron works, coal pits, quarries and several other industries. 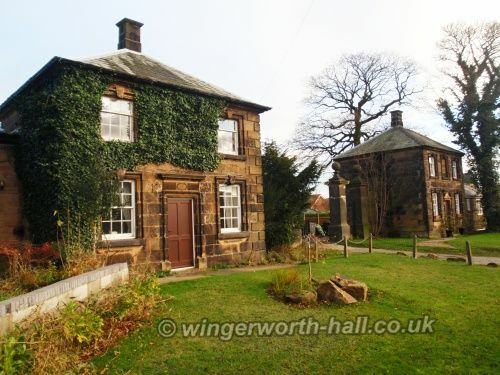 Sir Henry lived in the nearby Birdholme House using the hall purely for entertaining rather than live in it. The baronetcy became extinct in 18562 on Sir Henry’s death without a heir and the estate devolved to the great niece of Sir James, 7th baronet. His sister had married Philip Shelley-Sidney of Penshurst and in 1835 their eldest son was created 1st Lord de Lisle and Dudley. It was his daughter who inherited, having married Hon Frederick Fitz Clarence a son of the 1st Earl of Munster, an illegitimate son of William IV. She let the house to Sir Charles Allen, chairman of Henry Bessemer and Company of Sheffield who stayed until 1907. From 1907-18 he let the house to Col Sir Charles Seely MP one of the richest men in the country. On her death the estate passed to Sir Philip Perceval who was distantly related to Prime Minister Spencer Perceval the only British Prime Minister to have been assassinated. Like his aunt he assumed the additional surname and arms of Hunloke and had more interest in sailing26 and the London Court. He financed his lifestyle by borrowing money against the estate and continuing to let the hall. After reoccupying the house briefly in 1920 he attempted to sell the house but was unable to find a buyer. After residing for a couple of years at Buckenell Manor in Berkshire, Hunloke bought Cowbridge House, Malmesbury, where he lived for the rest of his life. 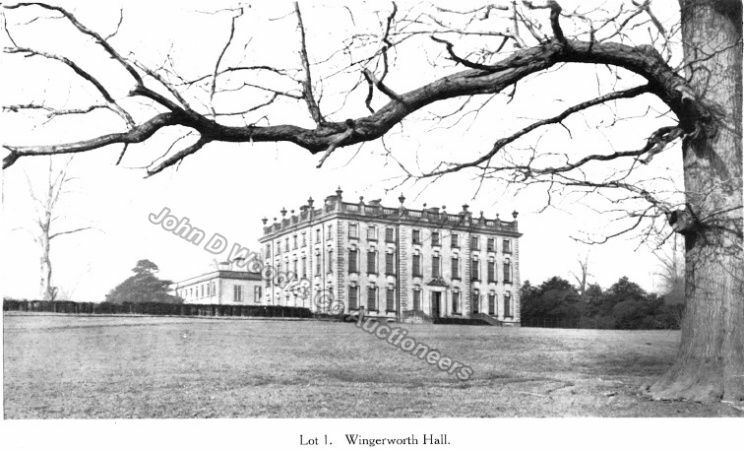 When Wingerworth Hall and 260 acres was auctioned in May 1920 the bidding started at £60,000 but there were no bidders at this price nor at £50,000 and £40,000. A second auction was held in July 1920 when again it was not sold. Sir Philip offered it to a local farmer for £12,000 but eventually W M Twigg and Sons of Matlock bought and demolished it. One of the Wingerworth Hall rooms was sold to the St Louis Museum in Missouri. The staircase, drawing room and library were for sale at Robersons of Knightsbridge in 1929, but their fate is unknown. The seventeenth century wing and stable block were subsequently converted and much of the park has now been built on.